This method is one of the most useful when cutting structures like pillars of bridges and other heavy structures. We provide the method for large openings cutting structural components and any heavily reinforced concrete for almost unlimited cutting depth. The electrical force mixed with hardness of diamonds is very useful in cutting tough surfaces. We strive to execute a remarkable spectrum of Diamond Wire Sawing Services. Our services are executed using high-tech machines by our expert professionals. 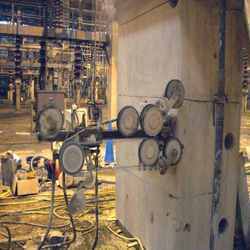 These services are employed by the pull method of diamond wire saw cutting. The diamond wire is threaded through a hole drilled at the top and bottom of the structure. We deal with various type of Diamond Diamond Wire Saw cutting Servicing. Applications Post construction bigger size cutouts in RCC slab and wall. We offering a wide range of Diamond Wire Sawing Services. By applying advanced technology, our professionals strive to satisfy clients and produce spectacular results. Offered range of service is rendered using superior quality inputs. In addition to this, the sawing process is executed so as to enable uniform quality results. A steel wire, coated in diamonds gives diamond wire sawing technique a problem solver when cutting into thicker materials. 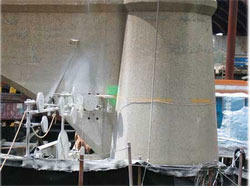 The technique involves pulling a diamond-beaded wire loop through materials reinforced concrete, masonry or metal using a system of pulleys, all activated by an electric or hydraulic drive unit. Dey Confident Civil & Mechanical Eng. Pvt. Ltd.
Keeping in mind the full requirements of customers, we provide Diamond Wire Sawing Service. In addition to this, this service is known for consistency, flexibility and timely completion. Our service is rendered by expert’s team who use advanced technique.